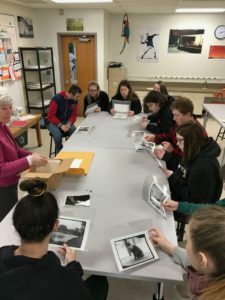 Students in Mrs. Wallace’s Introduction to Photography class had a visit with Mrs. McClave, the President of Stephentown’s Historical Society on Tuesday, January 29th. Glass slides taken by Photographer Howard Gillett were gifted to the Stephentown Historical Society. These slides were all of scenes from within Stephentown. The slides have been restored and printed. 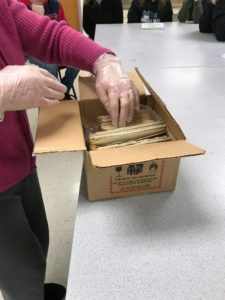 Students were able to learn about this process along with seeing the glass slides and the developed photographs that were originally taken in 1907. The students were amazed to see the quality of the images along with how much their town has changed over the past 100+ years. This was a wonderful experience; The Art Department hopes to continue to work with Stephentown Historical Society by entering photographs in their upcoming Photography Exhibit.